Because of the expense and risks in evaluating new drug entities, minimizing the parenteral formulation process/time is critical to initiating clinical studies. For this reason, many companies have initiated clinical studies with frozen solution. However, this creates other problems in processing and distribution. A more feasible approach to short circuit the formulation process is lyophilization (freeze drying). Consider Dobutamine HCl; it was initially launched by Eli Lilly & Co. as a lyophilized product because the solution was extremely sensitive to oxidation. A solution product was introduced after formulation and processing issues were resolved in order to provide a stable solution with acceptable expiration dating. Development of an acceptable formulation is imperative to achieving a reproducible lyophilization cycle and product. Utilizing the appropriate excipients is a critical part of the process. These excipients can include buffers and bulking agents, and when formulating proteins, include surfactants and cryoprotectants (sugar, trehalose, dextran, etc.). The bulking agent and cryoprotectant are utilized to enhance product stability, dissolution and plug appearance. The glass transition and collapse temperatures (Tg/Tc) of the formulation are determined by differential scanning calorimetry (DSC) and freeze dry microscopy (FDM). Lyophilization involves three stages: freezing, primary drying and secondary drying. All stages are important in achieving a reproducible lyophilization cycle. The freezing rate affects the ice crystal size. Slow freezing, which occurs with freezing on a lyophilizer shelf, results in large ice crystal formation, and may adversely affect protein stability thus requiring a cryoprotectant. An annealing step in which the product temperature is maintained above Tg for several hours, may be utilized to crystallize specific excipients or to obtain more uniform ice crystals. Annealing may result in a shorter cycle and shorter reconstitution times. Primary drying (sublimation process) is the longest and most critical phase of the cycle. The primary drying time is controlled by pressure and temperature. The formulation affects the rate at which drying occurs. Factors such as Tg, Tc, ice crystal size, crystallinity, plug size and density can be critical. Formulating with excipients that result in a low Tg allow the application of higher temperatures to enhance drying. Primary drying may remove up to 90% of the “free” water by sublimation. The “bound” water is removed during the secondary drying phase through desorption by increasing the product temperature. Generally product temperatures for secondary drying can range from 25°C – 40°C with target moisture levels below 1%. In addition to the drug assays, the lyophilized product should also be tested for residual moisture, cake structure, solution appearance, and dissolution time. For manufacturing Phase I and II clinical supplies, lyophilization cycles are generally more conservative to minimize the loss of limited and expensive API. 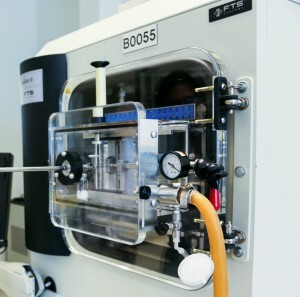 As the product approaches the commercial stage, it is critical to develop an optimized cycle to improve efficiency and robustness of the lyophilization cycle. 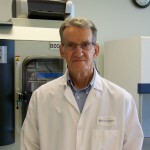 Al has 40 years experience in parenteral formulation and processing and worked for 24 years in the Parenteral Development Department at Eli Lilly. His experience includes development of solution, suspension, lyophilized and semi-solid parenteral dosage forms (large and small molecule). These dosage forms have included both small and large molecules. He has extensive experience in sterile processing and scale-up. Al has managed a GMP, clinical trial manufacturing facility for Eli Lilly and parenteral development departments for Cook Pharmaceutical Solutions and Baxter.